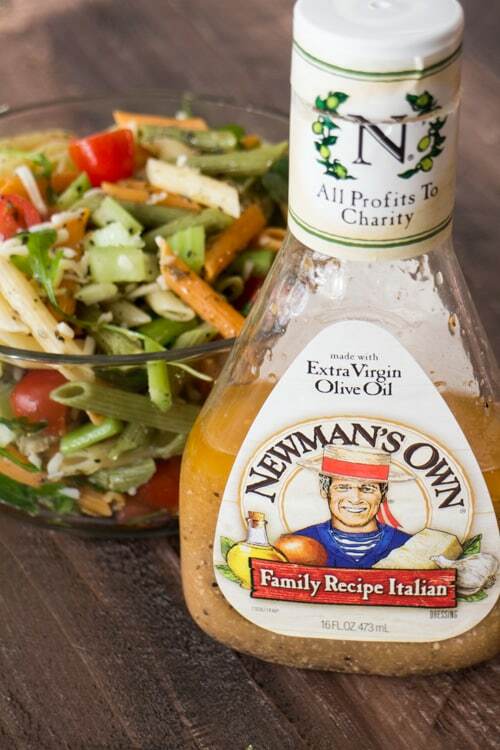 For my pasta salad I used Newman’s Own Family Recipe Italian because it’s my favorite. The dressing needs some tang to it while being full of herbs as well. You can also make homemade salad dressing too! This recipe makes 6 servings, each serving coming in at 293 calories. Since it’s filled with vegetables, it’s a perfect light Summer time meal! 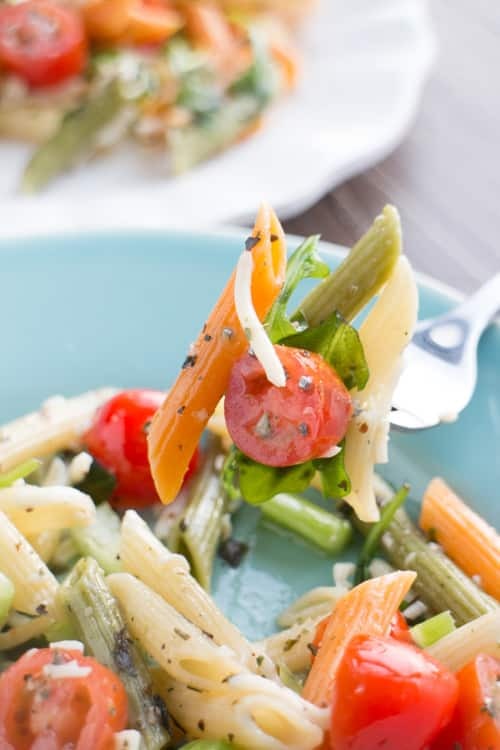 This classic Italian Pasta Salad is vegetarian. I know some people think Italian Pasta Salad needs to include Italian meats, but I make this just like my Mama did growing up – no meat, just lots of vegetables! If you need a salad to make quick for a get together and don’t want to eliminate your vegetarian guests – this is it! Everyone will love it! I hope you enjoy this Italian Pasta Salad! 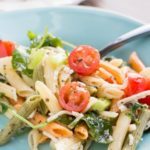 EASY Italian Pasta Salad recipe! 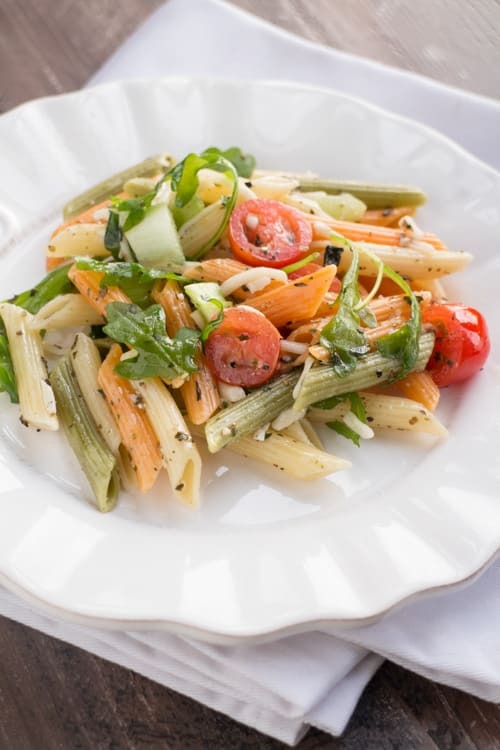 This vegetarian recipe uses Italian dressing, tri color pasta, fresh cherry tomatoes, celery and arugula! It's the perfect garden Summer salad! Cover, put in fridge to chill for 2 hours. Me too, I love their pizza! Hi Pamela, watched the vide, you did such a great job, makes me want to go out and make that salad today. Take care! It’s been sooo hot and humid by us – I’ve been avoiding going outside! This pasta salad sounds wonderful! Your plants are looking amazing! And so is this Salad! I haven’t tried Newman’s yet – but next time I gotta look for it! I don’t know about Brooklyn, but there’s no hotter or humid place on earth that Manhattan during a hot summer. And I’ve lived in Florida! Really a sweltering place. Anyway, I’m with you on wanting cooling dishes during the summer. And I always crave veggies then! This is my kind of dish — thanks. Hey John, it’s the same thing here. 🙂 Subways are the worst… so I zip by on my scooter! 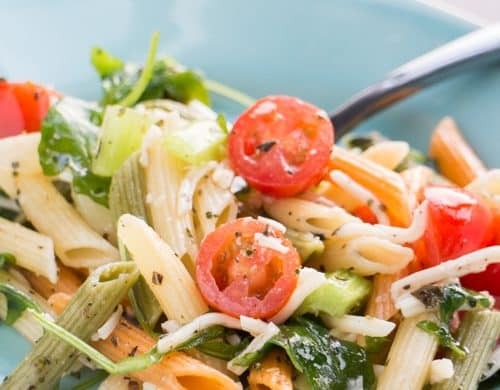 Pasta salad is exactly what I want to eat on a hot day! This sounds so tasty and fresh. Love all the homegrown vegetables! I’m a huge sucker for pasta salad! Once I make it once, I’m craving it for weeeeeks. Also, super jealous that you have little baby tomatoes growing! I love this idea! 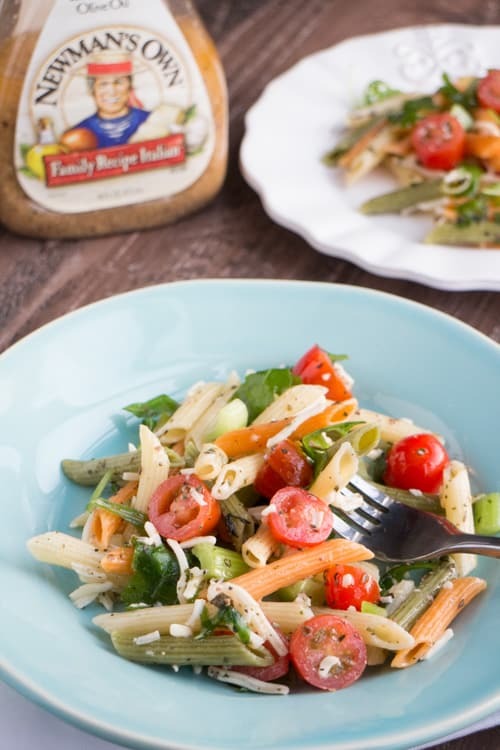 My family loves pasta–what a great way to incorporate veggies! 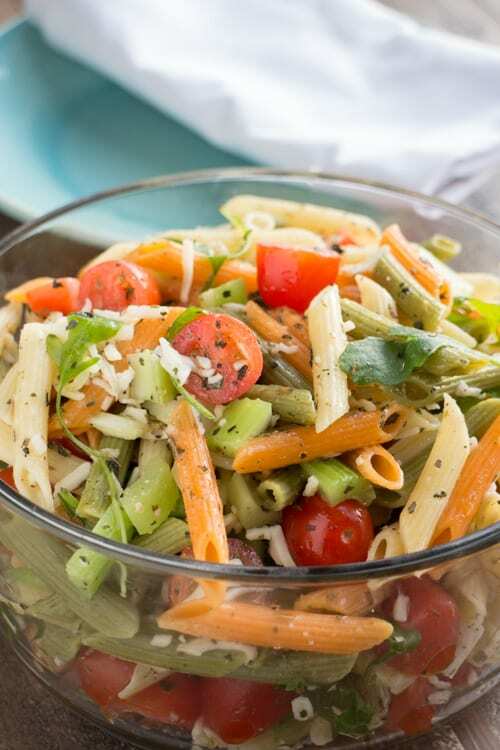 This pasta salad looks so delicious, Pamela! Perfect summer food! I’m with you about a chilled pasta salad being a perfect summer evening meal. Your tomato plants look terrific…soon your counters will be overflowing with wonderfully sweet tomatoes. I love pasta at all times of the year. This sounds amazing! 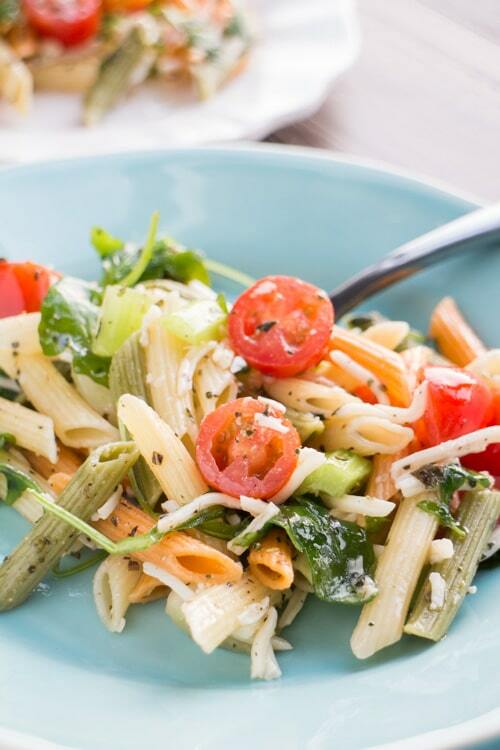 There is nothing better on a hot day than a cooling pasta salad! My cherry tomatoes have lots of flowers so soon! I LOVE how colorful this is. Fresh veggies are the way to go! Living in Queens, I totally agree with you how brutal it is here in NYC during summer and I am with you on cooling down with some refreshing salad. I make my own dressing a lot of time now but when I don’t have the time or ingredients Newman’s my choice. Thanks for sharing! A healthy past dish that my family will surely love. i totally agree that this dish is perfect for this summer season. Will surely try to make this pasta salad. Thank you for sharing.